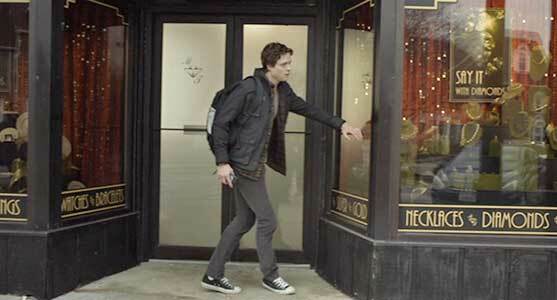 Douglas Smith wears black high top Converse “Chuck Taylor” All Stars in the film. Sasha, John, and Elliot enter their new home for the first time. The Bye Bye Man starts with a flashback to a mass murder scene in the year 1969. A crazed man named Larry Redmon (who we later learn was a reporter) is in a Madison, Wisconsin neighborhood killing family members and neighbors with a shotgun. While doing this he demands to know if any of these people have spoken “the name”. He continually repeats a strange mantra, “Don’t say it, don’t think it; don’t think it, don’t say it.” Next we are taken to present day at the University of Wisconsin where we meet the three main characters, college students Elliot, (Douglas Smith), his best friend, John (Lucien Laviscount), and girlfriend, Sasha (Cressida Bonas). They have just secured the rental of a house off campus where they will live together. 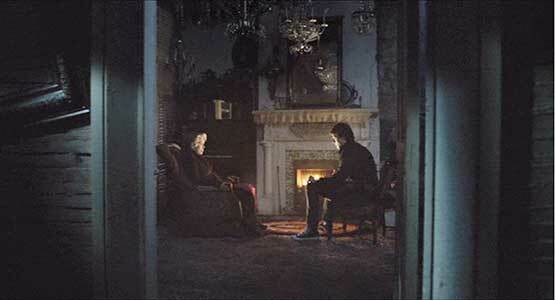 The house is a large rambling structure in a somewhat isolated neighborhood that hasn’t been lived in for a while. It does come with furniture, but that is stored in the basement. Soon they are moved in and happy, although Sasha thinks that it is a little creepy, and experiences strange things like doors slamming and hearing a coin rolling around on the floor. Within a few days she has developed a cough that won’t go away. 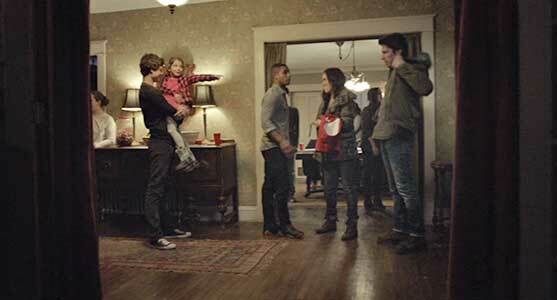 That weekend they have a house warming party where we meet Elliot’s brother, Virgil (Michael Trucco), and his niece Alice (Erica Trembley). While the adults are partying, Alice goes to explore the house on her own. Inside Elliot and Sasha’s bedroom, Alice hears a coin rolling on the floor and eventually picks it up and places it on the dresser. She also experiences a brief vision of a wolf’s head. Alice hurries back down to tell her uncle and father about what happened. When Elliott goes to investigate a little later, he finds the coin back on the floor, and puts it inside the nightstand. But as he is leaving, he hears the coin rolling again and finds it back on the floor. When he opens the drawer of the nightstand to figure out why, he discovers that the shelf paper inside the drawer has circular writing all over it repeating the phrases “Don’t say it, don’t think it”. Underneath the paper are the words, “The Bye Bye Man” written on the wood. Elliot holds his niece Alice while his brother Virgil looks on. Later that evening after everyone else has left, Elliot, Sasha, John, and Kim (Jenna Kanell), John’s girlfriend who has some psychic abilities, hold a seance. At first the seance is conventional with Kim telling private things about her companions. Then all of a sudden, Kim becomes quite freaked out and ends the seance, telling the others that something evil is coming, and that the spirits were telling her “Don’t say it, don’t think it”. Elliott finishes her thought by saying, “The Bye Bye Man”. All the lights suddenly go out, leaving them sitting in the dark, very disturbed by what just occurred. The evil forces of the The Bye Bye Man now begin to take over their lives. Sasha’s condition gets worse, and all three of them begin to experience hallucinations designed to break up their friendship. John and Kim break up, Elliot begins to suspect that John and Sasha are cheating on him, and Sasha sees visions of John coming on to her, although none of this is actually true. Elliot is further disturbed when he discovers real scratches in the brickwork on the side of the house that weren’t there before. Elliot and Sasha decide to do something about what is happening to them. John heads back to campus to research the Bye Bye Man, while Sasha goes to see their landlord to see if they can get out of their lease. Elliot and Sasha’s relationship become strained due to events in the house. At the campus library, Elliot cannot find anything about the Bye Bye Man on the Internet or in the catalogue of books. However, he did find one reference to “Don’t say it, don’t think it” contained in an archived dossier. After a librarian helps Elliot to find the report, he learns that appearances of the Bye Bye Man are cyclical. Back in the 50s a teenager murdered his family, and told a reporter in an interview that the Bye Bye Man compelled him to commit the crimes. The reporter, Larry Redmon, was responsible for the next cycle, as shown in the opening sequence. As he is reading, Elliot has more hallucinations and begins mindlessly scribbling on the dossier, trying to cross out any mention of the Bye Bye Man name. When the librarian discovers what Elliot is doing she chases him out of the library. Elliot then goes over to Kim’s place to see if she will do another seance. But on the way home, Kim has a vision of a family trapped on the railroad tracks, runs out of the car to help them, and is killed standing in the way of a speeding train. After Elliot is cleared of her death by the police (she left a suicide note), he next visits the widow (Faye Dunaway) of the reporter, who reveals that the Bye Bye Man curse causes insanity, hallucinations, and eventually death. Worst of all, she tells him that the only way to prevent the curse from infecting other humans is to never think of that name or speak of it. If someone already knows, they must be killed. This is a dilemma that Elliot and the other now must face as the film works toward its conclusion. Elliot in the grips of paranoia spies on John and Sasha. The Bye Bye Man is a typical second or third tier horror film, somewhat low budget and lacking a convincing script. One could say that it was a clever idea to avoid a lot of special effects because no one can think or say the name, but there really is no substance behind the Bye Bye Man. Character actor Doug Jones is wasted in his role as the Bye Bye Man. He has only a couple of minutes of screen time where he appears in a ghoul costume, and we never find out what motivated him to be such an evil force in the world, or for that matter how he ever got the power to take over other people’s lives so completely. A few other scary images include a hairless dog chomping on victims and afterwards scenes of train wrecks and bloodless mass murders but there isn’t a lot of suspense like there could be just using that “don’t say it, don’t think it” mantra as it gets into peoples’ heads. Of all the actors, Douglas Smith comes out the best as the lead character, Elliot. There at least is some dimension to his character as his life stumbles out of control making him more relatable than the others. If you like horror films, The Bye Bye Man is worth a look, but even though it sets itself up for a sequel, it is highly unlikely there should be one. Elliot meets with Larry Redmon’s widow to find out how she was able to survive. Elliot discovers the gold coin the the name Bye Bye Man on it. 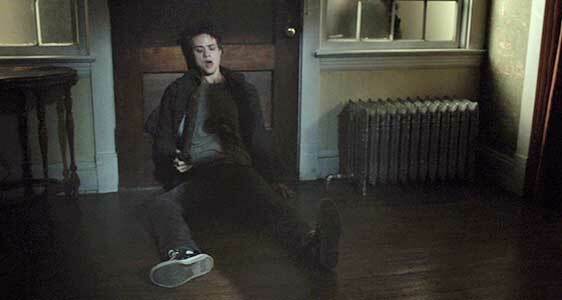 Douglas Smith as Elliot wears black high top chucks throughout the film, a popular footwear choice for college students. Wearing chucks gives Elliot a friendlier, more down home look than the other characters in the movie. 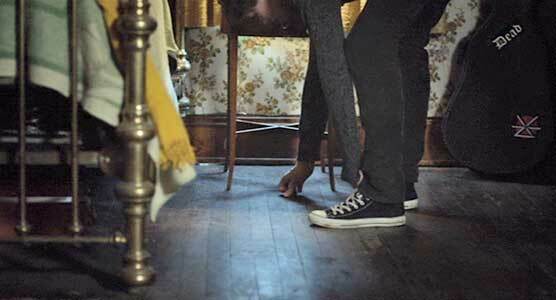 Wearing chucks also helps his character stick out in the cinemaphotography, since many of the scenes have a dark tone to them. The best close up occurs when Elliot discovers a gold coin on the floor. He leans down to pick it up from the floor, then puts it into the bedside table, where it immediately falls out again. This is when he first discovers the obsessive mantra writing “don’t think it, don’t say it”. At his wits end, Elliot barricades the front door with his body. The Bye Bye Man. (2017) Douglas Smith, Lucien Laviscount, Cressida Bonas, Doug Jones, Carrie-Anne Moss, Faye Dunaway, Michael Trucco. Directed by Stacy Title.